High-profile attacks on major cities in Belgium, France and the United States have set the world on edge. Commentators are talking of a new kind of protracted guerrilla war stretching from the Americas and Europe across Africa, Asia and the Arab world. This one is irregular, hybrid and networked, involving a constellation of terrorist organizations such as ISIS and Al Qaeda. Rather than hitting specific groups of people or symbolic sites, cities themselves are coming under siege . Complicating matters, violent extremists are recruiting directly from poorer and marginal neighbourhoods across the West. The extent of local recruitment and so-called “extremist travelling” from Western countries is certainly cause for concern. One study estimates that as many as 31,000 people from 86 countries have made the trip to Iraq or Syria to join ISIS or other extremist groups since June 2014. It is not just Western Europe or North America that is proving to be fertile ground for so-called remote radicalization, but also Russia and Central Asia. Many foreign fighters are killed while fighting abroad, but as many as 30% of them eventually make the trip back home. Politicians are scrambling to respond and hate crimes against minority groups are on the rise. It is statistically undeniable that terrorist violence is on the rise. But is today’s terrorist violence really more intense and widespread than in, say, the 1960s and 1970s? Are Western European and North American cities really the new front line of a global jihad? The answer partly depends on how terrorism is defined. There is currently no international legal or even academic agreement on what constitutes terrorism. Some experts say that it consists of violence perpetrated by non-state actors against civilians to achieve political religious or ideological change, but that sounds a lot like armed conflict. Complicating matters, governments routinely conflate terrorism and insurgency . One way to better map out the extent of the terrorist threat is to follow the data. Notwithstanding serious challenges related to the quality and coverage of statistics on terrorism, warfare and homicide, it is possible to detect trends and patterns by honing in on the prevalence of lethal violence. It turns out that extremist violence is much less pervasive than you might think. As other analysts have noted , it is significantly more prolific outside Western countries than in them. A recent assessment of terrorist risks in 1,300 cities ranked urban centres in Afghanistan, Iraq, Libya, Nigeria, Pakistan and Somalia as significantly more vulnerable than those in Belgium, France, the UK or the US. At least 65 cities were described as facing extreme risk, with Iraq – especially Baghdad, Mosul, Al Ramadi, Ba´qubah, Kirkuk and Al Hillah – fielding six of the top 10. 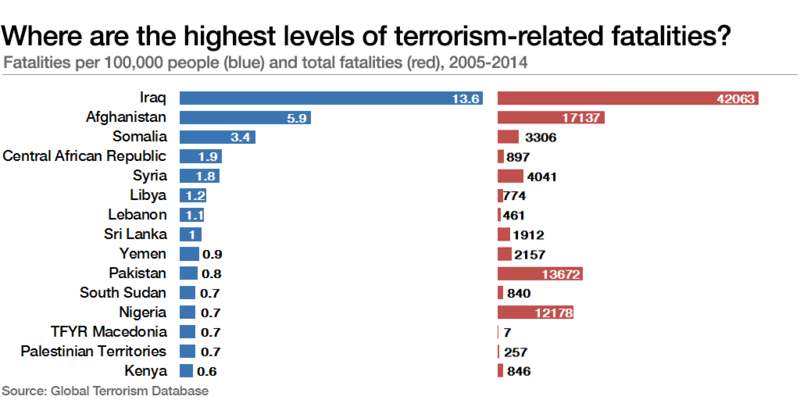 Consider that between 2000 and 2014, there were around 3,659 terrorist-related deaths in all Western countries combined. In Baghdad there were 1,141 deaths and 3,654 wounded in 2014 alone. Note: Fatalities are classified as terrorist-related if the action occurs outside the context of legitimate warfare activities, insofar as it targets non ‐ combatants as expressed by international humanitarian law. Innocent civilians are much more likely to be killed during the course of armed conflicts. The difference between the two is that terrorism is intended specifically to indiscriminately kill civilians, while in wars the killing of innocent civilians and prisoners is expressly prohibited, even if it does occur. War-related killings may be labelled criminal or even terrorist when they are determined to be disproportionate. So how does the risk rating of violent deaths occurring in war zones compare to those due to terrorism? 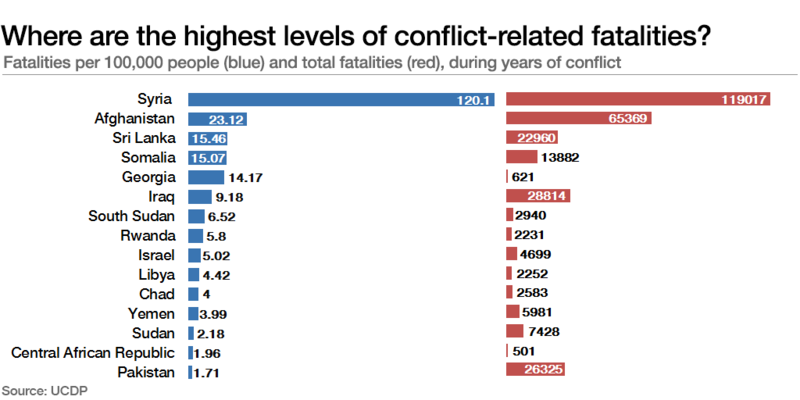 The Uppsala Conflict Database Program records conflict deaths occurring in more than 60 wars between 2005 and 2014. After adjusting the absolute numbers of violent deaths relative to the total population per country, it is possible to determine an approximate conflict death rate per 100,000 people. It turns out that the risk of dying violently from war is considerable higher than the probability of being killed in the course of extremist violence. Although in some countries this risk is an order of magnitude higher, the overall conflict death rate in conflict zones is still far lower than many might have predicted. For example, the average conflict death rate is sky-high in Syria – site of some of the most horrific warfare over the past decade. But it is comparatively lower in places like Afghanistan, Iraq, Libya, South Sudan, Chad and Yemen, countries that have been exposed to industrial-scale violence. The conflict death rate of course varies according to the ebb and flow of warfare, but the average prevalence is surprisingly low. Note: Conflict deaths are defined as “battle deaths” caused by warring parties that can be directly attributed to combat. This includes traditional battlefield fighting, guerrilla activity, bombardment of bases and other actions where the target are military forces or representatives of the parties. Collateral damage, including civilian deaths, are counted. And now for the most surprising finding of all. A review of the data reveals that civilians around the world are much more at risk of being killed as result of homicide than either terrorist violence or warfare. Drawing on the Homicide Monitor, it is possible to track murder rates for more than 225 countries and territories from 2005 to 2014. 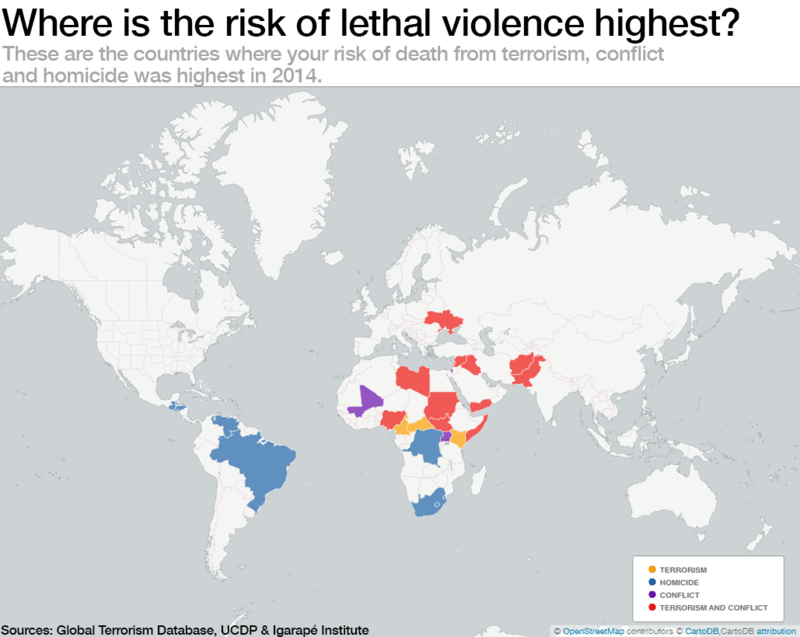 As in the case of terrorist and conflict-related violence, there are also hot spots where murder tends to concentrate . People living in Central and South America, the Caribbean and Southern Africa are more at risk of dying of homicide than in most other places. The most murderous countries in the world include El Salvador , Honduras, Jamaica, Venezuela, the US Virgin Islands, Guatemala, Saint Kitts and Nevis, Belize, Colombia, Trinidad and Tobago, and Brazil. About 46 of the 50 most violent cities are concentrated in the Americas. Also included in the top 15 most murderous countries, though located outside the Americas, are South Africa, Swaziland and the Democratic Republic of Congo. Note: Homicides are defined as the deliberate and unlawful killing of one person by another and are registered by police and health departments. So what does this morbid retreat into the data of violent death tell us? First, it is a reminder that a relatively small number of countries are dramatically more at risk of terrorist and conflict-related violence than others – especially Afghanistan, Iraq, Libya, Nigeria, Pakistan, Somalia, Syria and Yemen. While they must protect their homeland from terrorist events, diplomats, development experts and defence specialists would do well to double down on preventive diplomacy and conflict prevention in the most badly affected countries. Doing so could have a dramatic effect on reducing the global burden of terrorist and conflict violence and related humanitarian consequences such as refugee flows and internal population displacement. 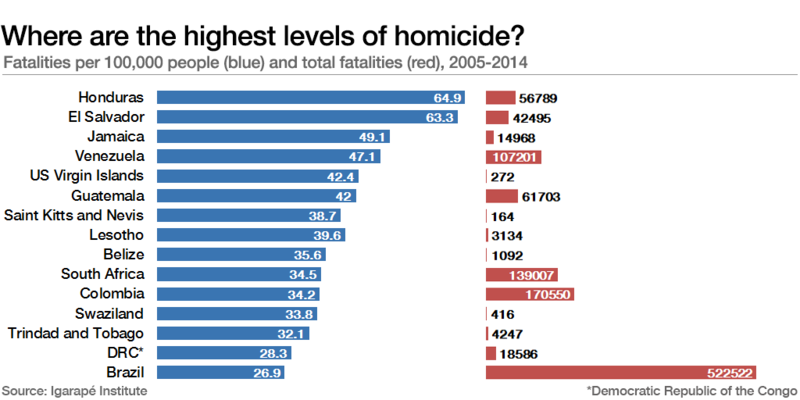 Second, there are also a handful of countries – most of them in Latin America and the Caribbean – where homicidal violence is off-the charts. Most of the murders in these states are concentrated in fast-growing large- and medium-sized cities. If homicides are to be reduced there, it is essential that federal and municipal planners focus on risk factors that are driving urban violence – not least social and economic inequality, high rates of youth unemployment, poor and uneven governance, and the limited purchase of the rule of law. There is mounting evidence of data-driven strategies that work – including focused-deterrence , cognitive therapy and targeted prevention , but they need sustained leadership to have lasting effect.